What is a Red Blend Wine? “Red blend” is a label designation for a red wine that contains more than one grape variety in the final blend. These wines can be made following well-loved traditional formulas, such as the Bordeaux blend of Cabernet Sauvignon, Merlot and Cabernet Franc, but this category contains a wide range of combinations. Wines under the red blend category vary in color, aroma, flavor, structure and ageability. Red blends from cool climates tend to be light and bright, while those from warm climates tend to be bold and dark. The varieties used, the region where they were grown, the season, as well as winemaker decisions, all play an essential role in how a red blend will taste. Winemakers blend red wines to complement a grape’s attributes. For instance, the thick-skinned Cabernet Sauvignon lends tannins to the thin-skinned, plummy Merlot. Tannins offer structure to the wine and can help the wine age. 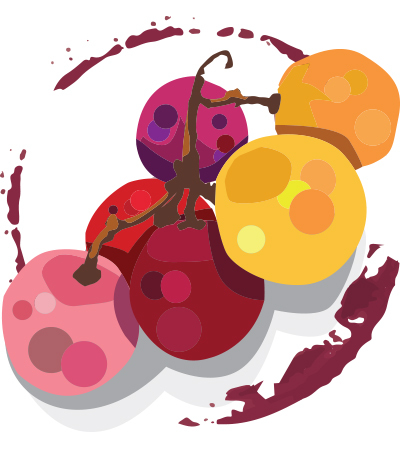 Typically, red blends are created by individually crushing and fermenting each grape variety. After the juice is extracted from the skins and put into lots, the blend is created through blending trials, which requires the winemaker to taste the characteristics of each trial blend wine. Sometimes juice from white wine grapes is added to provide additional nuances and balance, which is typical in the northern Rhône where the white grape Viognier adds levity to the Syrah-based wines. What happens in the vineyard and its location is just as influential as the winemaker. Region dictates the flavor components of any given varietal. A blend of Syrah, Grenache and Mourvèdre from Paso Robles will invariably have different tasting notes than a wine from the southern Rhône. These differences, sometimes subtle, other times remarkable, are what makes the maddeningly broad category of red blend worthy of a deep, investigatory dive. Another benefit to taking time to explore the wealth of selection under the red blend category is becoming acquainted with little-known, region-specific varieties. Borraçal, also known as Caíño Tinto, lends fragrance to red blend wines from Vinho Verde. There are even exceptional regional field blend red wines, such as Touriga Franca, Tinta Cão and Tinta Roriz (also known as Tempranillo) from the Douro, Portugal. From the most notable examples to intriguing new styles that illustrate New World terroir, the breadth of wines under the red blend category are cause for celebration. For more detailed information on which red blend to choose for the cellar, a casual night in or to bring to a dinner party, Wine Enthusiast’s Buying Guide can help you. Find the best red blends from our extensive database with thousands of reviews.